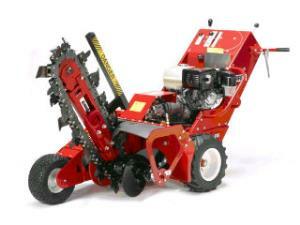 The full size, heavy duty Baretto trencher is able to cut a 4" wide trench to a maximum depth of 3'. It is hydraulically driven, with a very user friendly control panel, and features a dirt auger which allows for quick backfilling of your trench. The machine comes on its own trailer, which needs to be towed with a 2" ball attached to your vehicle. Local delivery is available, rates vary by distance. * Please call us for any questions on our trencher 4 inch w x 36 inch d rentals in Hillsdale and Ridgewood NJ.